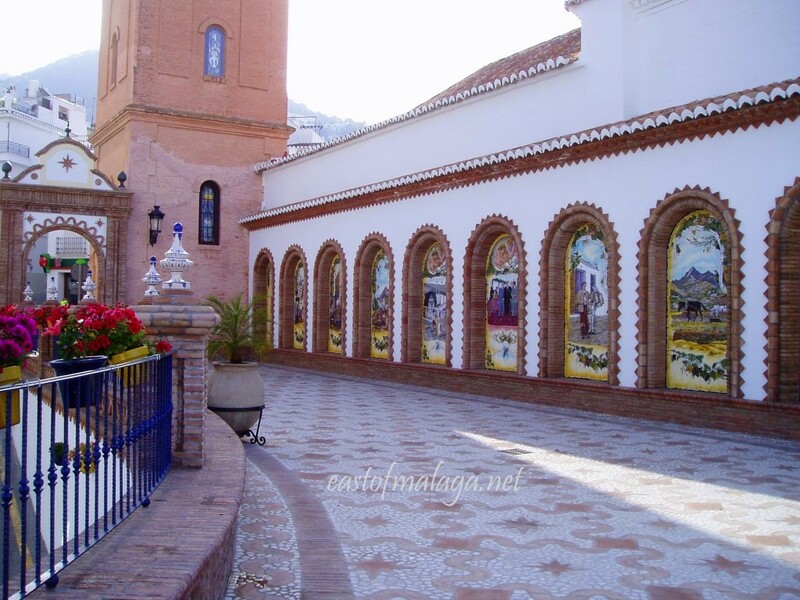 You can find El Paseo de las Tradiciones (The Walk of the Traditions) in the main square, Plaza Almijara, of the white, mountain village of Cómpeta. Completed in 2009 on the site of the old municipal market, El Paseo de las Tradiciones is annexed to the Church of Our Lady of the Assumption (La Iglesia de Nuestra Señora de la Asunción). 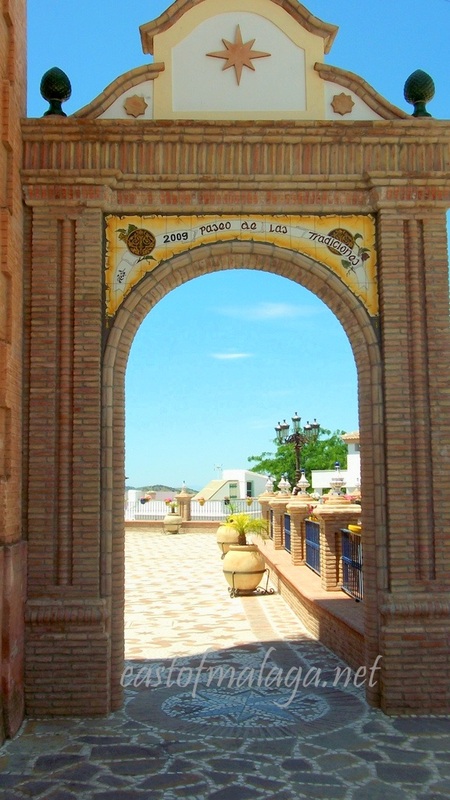 As you stroll from the busy square, through the archway into the Paseo de las Tradiciones you will discover an oasis of calm. The floor is decorated with an intricate Moorish pattern of terracotta and white tiles, alongside a series of ceramic murals celebrating the lives of generations of the ordinary working people of the village. 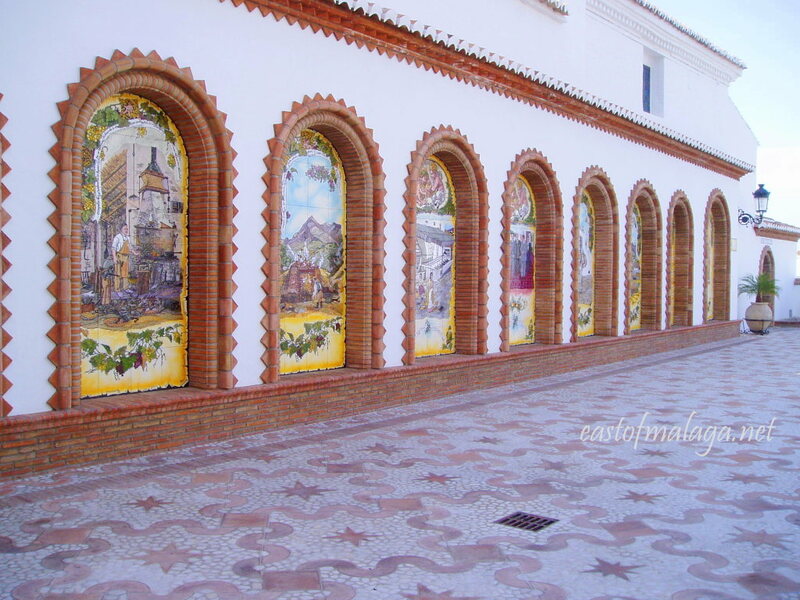 One wall of the Paseo de las Tradiciones pays testament to the trades and deeply rooted traditions of the people of Cómpeta through the ages. The beautifully modern, brightly coloured tiling in each of the alcoves was developed in the workshop of potter and sculptor, José Antonio Rivas. The nine alcoves, each 3 metres high and 2 metres wide, not only depict the history of the collecting of the local vines, the muleteers and village smithy, old olive oil factory and the public laundry, but also recognize the contribution made by the Moors, who for 800 years did so much to improve the cultivation of the summer-dry, winter-wet sierras, bringing the first prosperity to the village. The past 500 years since the building of the Church of Our Lady of the Assumption have not been easy for the people of Cómpeta. The expulsion of the Moors, two great earthquakes followed shortly by a cholera epidemic, and the vine disease phylloxera,which devastated crops all over Europe in the mid-19th century, have all taken their toll, but the spirit of the villagers continues to thrive, as epitomized throughout the Paseo de las Tradiciones. Where is your “oasis of calm”? This entry was tagged Andalucía, Cómpeta, culture, customs, East of Malaga, Europe, life, Malaga, Spain. Bookmark the permalink. These are magnificent architectural structures. 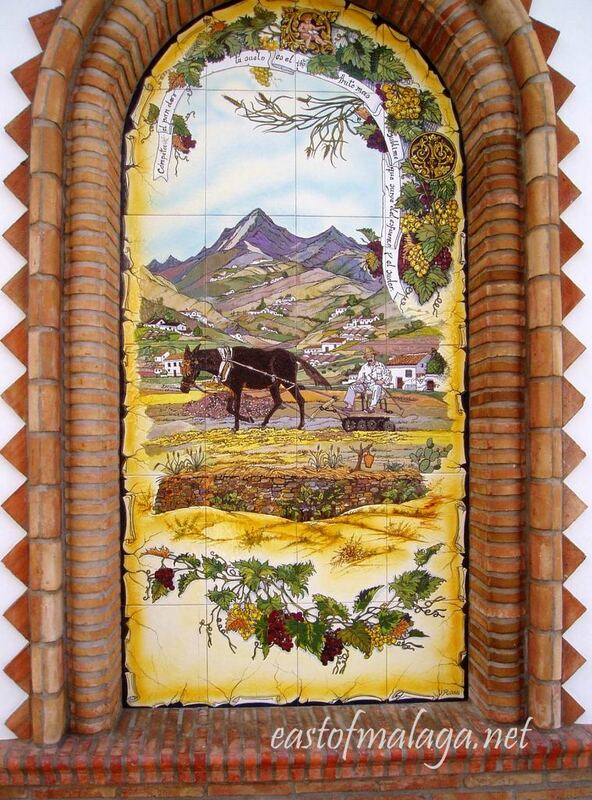 The hand made tile and th images portray their cultue. This post is quite informative and showcases the buidlings, view and fabulous windows so beauifully. I love that craftmanship . It is a dying art. The colors look very vibrant even today. Great photos – thanks. OH, this is a new area, built only in 2009 (you can see the date written above the archway in the second photo), but obviously using beautiful modern tiling reflecting the old cultures of the area. You´re right though, it IS a dying art. Great craftsmanship!